My mother has always been a master at stretching a dollar because she’s had lots of practice most of her life. As a single mother of three children under the age of five by the time she was 25, she worked hard to put a roof over our heads and food on the table. She was very good at providing us a life we never considered was lacking, even though by today’s standards, most would say it was. Our clothes were mended and patched when they began to show wear, and those gently worn were passed down to the next child in line. Yes, we had toys, but more often, we ran around outside playing with friends at imaginary games. We ate only at meal times, and when we did, the food was simple and filling. Often, beans were on the menu, and on those days when my little sister asked what we were having for dinner, the response would be, “Hundreds of wonderful things.” And why not when you consider that a two-pound bag of pintos costs only a few dollars even at today’s prices. As much as I still enjoy a good pot of beans, white beans, or cannellinis, are what we most enjoy now. 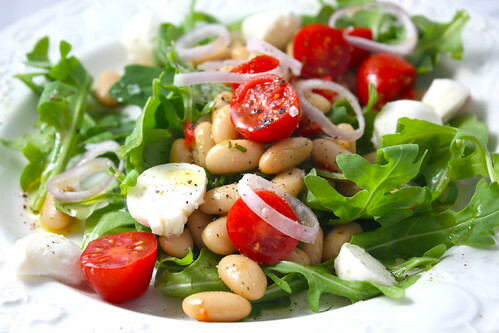 Often referred to as white kidney beans, they’re related to navy beans, or great northern beans. I often keep a can or two in my pantry, but I always have a small bag of dried beans as well. They find their way into so many different quick dishes these days — like pasta, soup, or salad. Our favorite way to eat them is with wilted dark greens such as chard or kale, and lots of garlic. On some nights, sun-dried tomatoes are tossed into the mix, and others, whatever pasta I have in the pantry helps bring everything together. 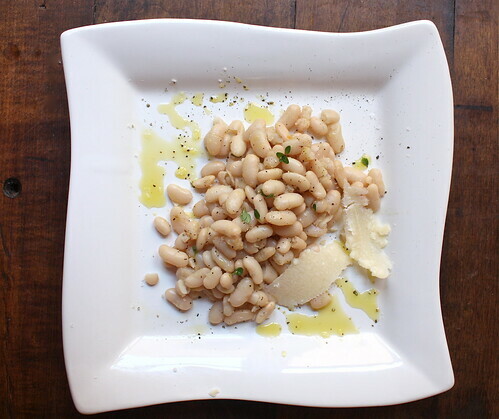 This recipe for “Cooked Shell Beans” is from Frank Sitt’s Bottega Favorita and is a good starting point for so many fabulous recipes, including a nice Bean Puree if you add some roasted garlic. Put a pot on this weekend, and enjoy all the possibilities. Place the pre-soaked beans (see notes below) in a large pot and cover with about 3 inches of cold water. Split the leek lengthwise, removing the dark green leaves and rinsing the remaining light green and white pieces well. Quarter the onion and carrot, adding those as well. 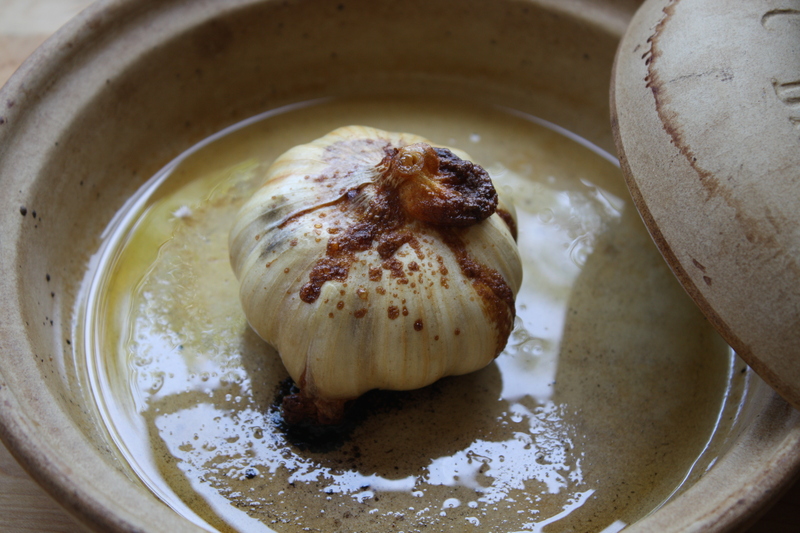 Smash the garlic cloves, remove the peels, and add them to the pot. To make the bouquet garni, take a dark green leek leaf and wrap it around the other herbs, securing the package with a bit of kitchen string. Add it to the pot with the other ingredients and bring everything to a simmer over medium heat, partially covered. Continue cooking slowly, about 45 minutes, then stir in a few large pinches of salt. Finish cooking at a low simmer until the beans are very tender, an additional 45 minutes or so. To serve, use your imagination! Here, cannellinis (sans bean broth) are served with a good extra virgin olive oil, some fresh thyme, maldon salt, cracked pepper, and shaved Parmesan. However you serve them, don’t throw out the bean broth! It can be used with the beans for soup, to lighten a pasta dish served with beans, to braise vegetables, or to make bean puree (recipe follows). Dried beans need to be soaked before cooking. Slow method: the night before you want to cook them, rinse them in a colander to make sure there are no stones or bad beans. (Honestly, in all my years, I’ve never seen a stone in my bag of beans, but my teeth can’t afford the risk, so I rinse.) In a large pot, cover the beans with 2 inches and let them sit overnight. They’ll swell quite a bit. Discard the liquid when you’re ready to cook them. Fast method: Cover the pot and heat the beans and water to a boil. Turn off the heat and allow the beans to sit covered for about 1 hour. During the cooking time, if desired, add water to keep the beans submerged by about 2 inches. 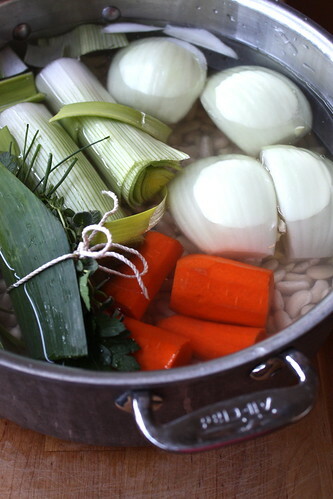 This will give you a good amount of bean broth. If you choose not to, you’ll have a thicker sauce with your beans. I know what you’re thinking. Beans give you quite a bit of intestinal discomfort. The soaking process is supposed to help with that, so plan ahead. Rancho Gordo is a great source of information, products and recipes for beans. * When I attended the Foodbuzz Festival last November in San Francisco, I participated in an olive oil tasting seminar. 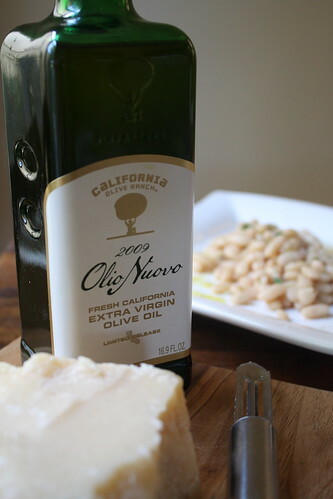 Not only did I learn that tasting olive oil is a similar process to tasting wine, I received a bottle of California Ranch’s Olio Nuovo to sample. Its pungent, fresh, grassy taste was a treat I’ll not soon forget. 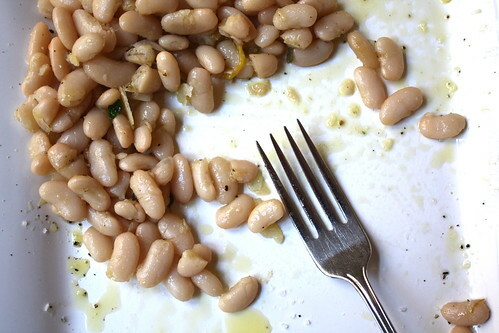 It was perfect on salads, crusty bread, and drizzled over these beans. The salad is one I never posted: arugula, fresh mozarella, shallots, roasted cherry peppers (or was it grape tomatoes? ), cannellini…I think it was Bittman No. 54. I’ll have to go back and check. 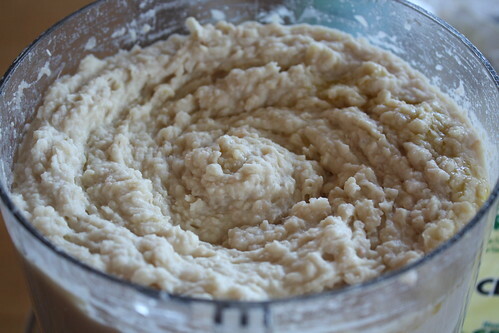 Add the cannellinis, garlic, and potato to a food processor and run until the mixture is smooth. If necessary, add a bit of the bean broth to lighten it. Taste, and season with salt and pepper. Drizzle on some very good extra virgin olive oil. Use as a dip for crudites, a topping for crostini, and pizza, or filling for ravioli. I love this. It’s wonderful as a dip with vegetables in place of fatty sour cream based dips. Make sure it’s the right consistency and seasoned well. If you’d like it with more carbs, toast pieces of a baguette with a bit of olive oil. Dip them into a bowl of bean puree drizzled with the olive oil. Fabulous party food. The roasted garlic is so good in this. 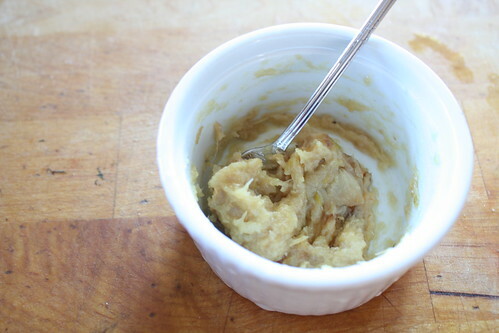 To send it over the edge, add a bit of the roasted garlic olive oil to the puree before digging in. 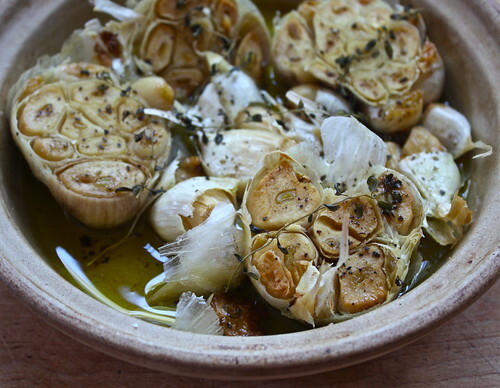 If you’ve never roasted garlic — it’s very easy. And you don’t need a ceramic roaster. Aluminum foil will work just fine. Halve two heads of garlic. Drizzle olive oil over the heads, salt and pepper, then sprinkle some fresh thyme over. Roast at 325 degrees about 45 minutes. Allow to cool then squeeze the garlic from the peelings and mash to use in the beans. Save the oil — it’s fabulous, but use it quickly over crostini, pasta, risotto, or grilled vegetables. 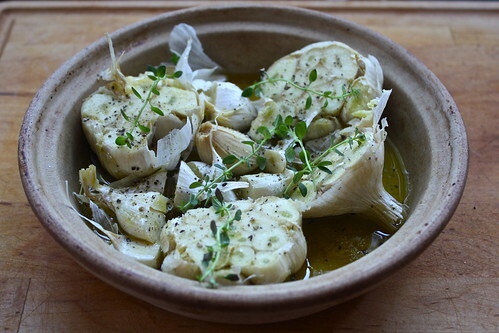 Roasted garlic is also delicious spread over crusty bread.